Exporting (Getting) data from Salesforce. Importing (Inserting) data into Salesforce. Insert, Update and Upsert operations. trigger.isInsert is true when a new record is created and inserted. trigger.isUpdate is true when an existing record is modified. Searches field values starting with the keyword 'test' in all fields in Account, Contact, Opportunity, Lead and displays the result. Searches Test in Name field in Lead with the condition CreatedDate is this fiscal quarter. 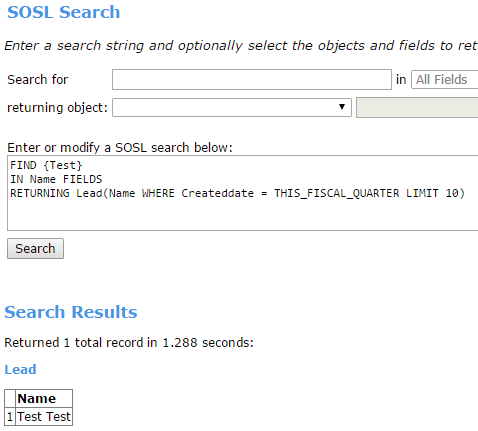 Use SOSL with the search() call to find records for one or more objects. The search() call searches most text fields on an object. How to insert line break in email message using Apex in Salesforce? To insert line break in email message using Apex in Salesforce, we have to use <br> tag. setHtmlBody() method is used here to send the email in HTML format. How are objects related to reports? What can be done with custom report types? Enhanced lists give you the ability to quickly view, customize, and edit list data to speed up your daily productivity. 'rowsPerPage' attribute must be one of the following values: [10, 25, 50, 100, 200]. How to find number of days between two dates using Apex? The above formula is used to find number of days between two dates. 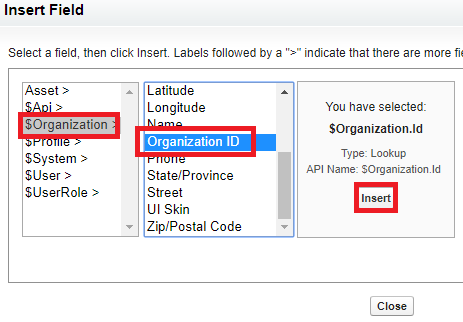 To get Salesforce.com Organization ID, Go to Administration Setup --> Company Profile --> Company Information -- > Salesforce.com Organization ID. How to log a case in Developer edition in Salesforce? 3. Click 'Log a Case'. 4. Fill and click 'Submit' button. How to display Dashboard in visualforce page in Salesforce? Here src is the source of the Dashboard. See the below figure to get the Dashboard URL. To display checkbox options in vertical direction, layout property is used. Below is the simple code to select Radio button by default in Visualforce page. tempList is List datatype and tempSet is Set datatype. Add some values to List datatype and use addAll() to add it to Set datatype.